Some refer to this civilization—however, I’m more inclined to think that many civilizations could have existed—as the antediluvian predecessor of the most important ancient cultures on Earth. How can you explain—from a logical point of view— prehistoric, ancient maps, depicting regions of our planet like Antarctica without ice? By doing some simple research you’ll come across not one, but countless maps that depict the same thing: The continent of Antarctica presumably without ICE. But… how is this even possible? We’ve only ‘found’ Antarctica recently. So how can there be maps of the continent depicting it free of ice? According to experts, Antarctica separated around 160 million years ago from the Gondwana supercontinent, beginning to cool down again. By 23 million years ago, Antarctica was mostly icy and for the last 15 million years, it has been a frozen desert under a thick ice sheet. Today, scientists estimate that 98% of Antarctica is covered by the Antarctic ice sheet, a sheet of ice averaging at least 1.6 km (1.0 mi) thick. The continent has about 90% of the world’s ice (and thereby about 70% of the world’s fresh water). Piri ReisThe fact that there are maps that depict Antarctica free of Ice, and other parts of the world that were not discovered until recently gives rise to MANY theories—some of them somewhat controversial. Interestingly, many authors—including myself—will venture out and say that these maps may very well prove that in the distant past, ancient explorers had an extremely well-developed cartography system comparable in precision to the one we have today. These maps could also ‘prove’ that ancient mankind knew the exact shape and size of the Earth, contrary to popular beliefs, and used spherical trigonometry, precise and elaborate mathematical calculations, as if thousands of years ago an unknown civilization undertook a global-scale project of mapping the entire planet like no one has ever done before. The result: numerous ancient maps that according to many prove our history is not what we’ve been told. The Zeno Map. Published around 1380, the enigmatic maps accurately depicts the coasts of modern-day countries such as Norway, Sweden, Denmark, Germany, and Scotland. This ancient map also happens to depict—somehow—the EXACT latitude and longitude of a number of islands on our planet. The Camerio map, created in 1502 uses a spherical grid, even though people in the middle ages still believed our planet was in fact… flat. The Iehudi Ibn ben Zara map, drawn in 1487 displays remnants of glaciers in Britain. The map also includes extremely detailed depictions of islands in the Mediterranean and Aegean seas. Today, these islands still exist, but due to rising water levels, these are now underwater. The Hadji Ahmed map, published in 1559, shows incredibly accurate delineations of the western coast of Northern America and Antarctica. The Buache map—created around 1737— is believed to be the result of much more ancient maps. This chart depicts Antarctica well before the ‘icy’ continent was in fact discovered. Interestingly, like many other ancient maps, this too accurately illustrates Antarctica without ice. Another shocking map is the King Jaime World Chart. Created in 1502, the map accurately depicts parts of the Sahara Desert displaying it much differently than it is today: with fertile land, huge lakes rivers and what appear to be ancient cities. The Oronce Finé World Map created in 1534, is an early cordiform chart which displays features of Antarctica when the continent was not covered by Ice. Just as the Buache map, the Piri Reis Map—one of the most famous ancient charts—is supposedly a collection of even older maps, displaying the correct coastline of Antarctica as it was under the ice. 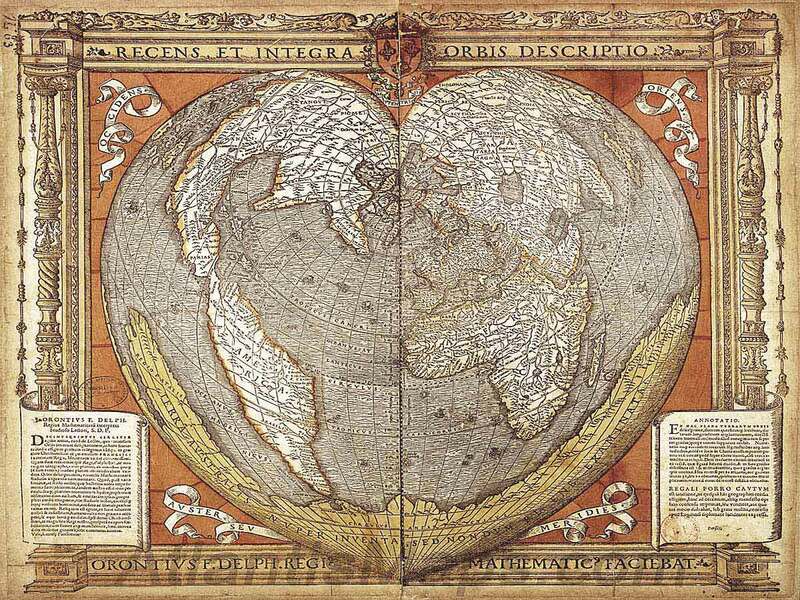 The map was composed around 1520 and in addition to displaying Antarctica without ice, it accurately depicts the geography of the American Continent with such a precision that it looks as if it was put together with the aid of aerial photography. Is it possible that all of the above maps are the result of an advanced ancient civilization that somehow managed to map the entire planet thousands of years ago—perhaps before the last ice age? If so, who was this mysterious civilization and does this provide enough ground to venture out and say advanced ancient civilization—like Atlantis—may have existed on Earth, terns of thousands of years ago?